Richard J. LeBlanc, Jr. has released his newest project and while I realize I'm likely to never, ever, actually use the Basic Psionics Handbook, I had to pick it up for a review later. I'll freely admit I've liked everything I've picked up from New Big Dragon Games Unlimited (seriously....everything), so "risking" $6 on the PDF is a pretty safe bet. I've always liked the layout and even though I'm not likely to play a psionicist, I wanted to read his take on it. Back in the day.....when I 1st started "playing" AD&D with my uncle we didn't have a fricken clue what we were doing. I do remember rolling up a PC with psionics, but damned if I can remember if it was a legit PC, a specific psionic allowance (ie, GM fiat and not RAW), or even straight-up cheating....although I highly doubt that I was cheating for a psionicist....I'd have gone for a Paladin instead. Regardless though, that PC never saw any action and we never did quite figure out how psionics worked...did anyone? My initial flip through looked good and I'm in the process of printing up and gluing my own book for later reading/review. 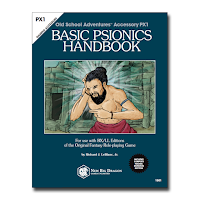 The PDF of the Basic Psionics Handbook is a couple bucks off for a while, so if you have any intention of picking up the PDF, now is a good time to do so.